Command attention with our modern Watercolor Diamonds sticker design template, ideal for companies wishing to portray a stylish, state-of-the-art image. Watercolor Diamonds stickers would work well for companies that sell shoes, sunglasses, jewelry or for wedding planners, interior designers, web developers, other technology-based companies, and more. Available in four different color schemes, two shapes, and three distinctive edge finishes, Watercolor Diamonds can easily be customized to fit your brand. 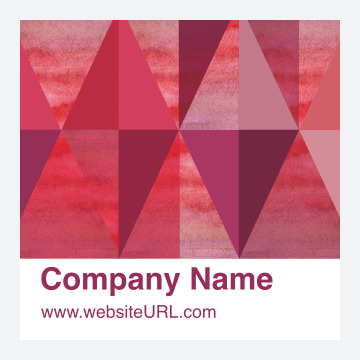 This custom sticker design features a colorful, multi-faceted diamond design on the top section with space below for your company name and other information, such as website URL. Use our online sticker maker to create and print custom stickers today! Our online design tool gives you the ability to customize your sticker design fast and easy. Just pick a professionally-designed sticker template and select a color scheme. Then customize your sticker text with whatever information you’d like customers to notice. Custom sticker printing takes just minutes with our intuitive design tool! When you’re done designing you can even generate a PDF to share with team members before you print. PsPrint prints stickers on premium paper stocks with rich, vibrant, soy-based inks that bring your design to life. High-quality printing at discount prices is why thousands of companies trust PsPrint with their print marketing projects each day. Plus, our 100% customer satisfaction guarantee ensures that you’ll be delighted with your finished stickers. Want your stickers to really stand out? Our foil stamping services add a shiny design element while our die cutting services can give you almost any shape you can think of. And our custom printing team is on standby to assist you with any help you might need. PsPrint is truly your best choice for online printing!